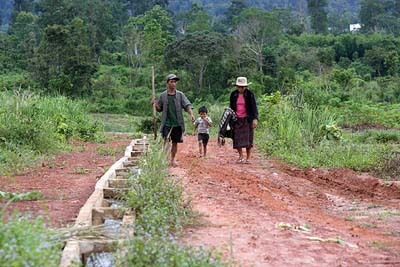 Mr Nyeung is village leader of the Thaveung group who moved to Nongxong resettlement village in 2009. "My field is not yet ready for growing paddy rice," he says, "so I've planted it with upland rice". 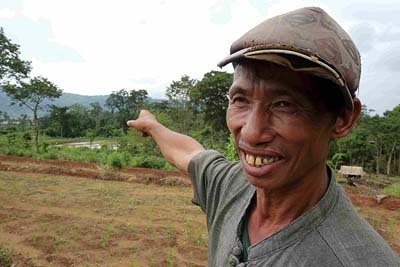 Mr Nyeung can grow enough upland rice to feed his family, but not all the Thaveung can do the same. "We have a surplus, but families with many dependents and few labourers find it harder while the paddy fields are still new," he explains. Mr Nyeung asked THPC to build a 'rice bank'. "They built this big granary", he grins. "Now we have a place to store our rice, and people can borrow what they need until their new crops are ready". 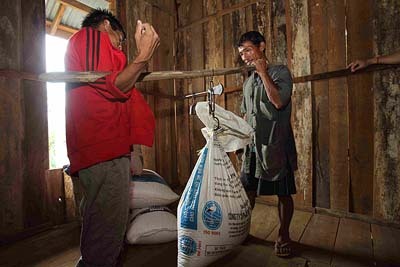 Families who have run out of rice come to the community 'bank' to borrow the staple until the next harvest.